Starting tonight! Halloween events are happening all weekend throughout the area, including Halloween parties, races, trick or treating and a very special concert by Jeff and Paige to benefit Mila’s Miracle Foundation. All happening this weekend, in and around Boulder. Cost: $5/Adult, $10/Child ($6/Member Child), Infants FREE, Dinners available for purchase in advance. Tickets here. WOW! Children’s Museum is throwing a Halloween Bash, and you’re invited! Come dressed in costume for an evening of family friendly Halloween fun! Including ghostly crafts, spooky science demonstrations, ghoulish games, tasty treats, magical giveaways, and more! Boxed dinner is available for purchase in advance. Dinners will include sandwich, cookie, chips, pickle, and drink. Join High Altitude Archery for its Halloween Fun Shoot. They have prepared moving targets and interesting treats and tricks, and will be providing light refreshments. Jeff and Paige invite you to support our young friend Mila’s life this Sat., October 28th 10-12:30. AND Enjoy a J&P Concert, Story Corner w. Melanie the librarian, magic w. Mitch Harwood (Mysto! ), HALLOWEEN photobooth w. Natasha Rigg Photography & more at Boulder JCC. Wear your costumes! An update from the family: This week Mila of Mila’s Miracle Foundation to Stop Batten got to meet the doctors and scientists working on her trial gene therapy for first time! They fell in love with her (and her huge smile!) and were so impressed with how alert and responsive she is. The drug will NOT be produced if they miss their deadline of $500K by November 17th. To make a donation, and to find out more about Mila, visit her go fund me page here. Boulder Cycle Sport is hosting the third annual Lil’ Ghost & Goblin Ride! a fun, casual cruiser/townie bike-style ride from our Outlet location in South Boulder along safe biking routes to a secret location, not far from the shop, where you will receive a free surprise Costumes and helmets are mandatory in order to receive the free surprise! Meet at 12:45 for route instructions and ride leader intro. Ride departs at 1:00pm. Ride starts and ends in front of Boulder Cycle Sport Outlet. It’s time once again for Niwot’s amazing Great Pumpkin Party! Costume up the kids, bring the kid-friendly dog, and head downtown for trick or treating, the parade, doggie costume contest, hayrides and more. For the full schedule, click here. The Town of Erie’s Trunk or Treat event has moved downtown and expanded, bring you Boo! on Briggs Street. Trunks will be parked in the parking lots on the southeast corner of Wells and Briggs and the northeast corner of Moffat and Briggs in Erie. Boo! on Briggs Street will feature costume contests (ages 0-8, 9+ ($5) and group/theme ($10)). Pre-register to reserve your spot in the costume contest here.. The night will be capped off with a glow-in-the-dark dance party complete with a professional DJ and complimentary glow-in-the-dark giveaways for the kids. Cost: 10k Adult $35, 10k Senior $30, 10k 16 & Under $30. $5k Adult $35, 5k Senior $30, 5k 16 & Under $30. Kiddie Goblin Run is FREE. The world famous Eerie Erie is a Halloween themed 5k and 10k race that runs through historic downtown Erie and takes advantage of our beautiful trail system that weaves along Coal Creek open space areas. The 10k passes by scenic Pleasant Hill Cemetery with panoramic views and where friendly spirits can’t wait to visit this year’s runners. Eerie Erie is the primary fund raiser for the Optimist Club of Erie, a non-profit organization whose sole mission is to benefit the children of our community by funding youth specific events, programs and activities throughout the year. Where: Parade lines up at St. Vrain Memorial Building, 700 Longs Peak Ave. Map of events here. Dress up in your Halloween Costume, for Longmont’s Halloween Paradeon Main Street and visit Downtown participating merchants for Trick or Treat Street immediately following the parade. 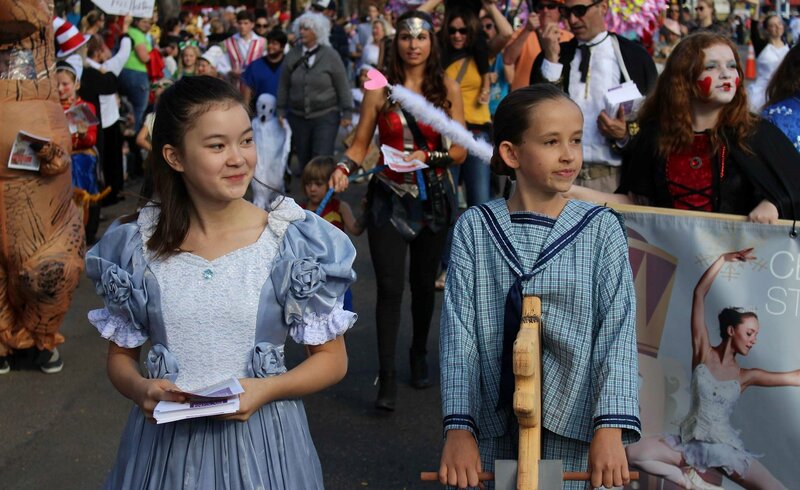 Kids of all ages can be a part of this costume foot parade. No registration is required! Strollers or wagons are recommended for tiny feet; no motorized vehicles or large animals. Dogs must be leashed. 9:30AM: Line-up in front of the St. Vrain Memorial Building.10AM: Foot Parade Start! Come in costume! Route will be lengthy; wagons and strollers recommended. Enjoy the sounds of local bands interspersed within the parade. Map of the event here. Cost: $5 Presale Tickets, $6 at the door, Purchase tickets here. You’ll have a hauntingly good time at the Broomfield Recreation Services’ Annual Spooktacular. Come dressed in costume and bring a bag for your goodies. The event will feature carnival games, jumping castles, wagon rides, crafts, entertainment and don’t miss out on the “treat or suite-ing”. Spooktacular is guaranteed to be a treat for kids of all ages! Cost: 5k Fun Run -$30 ($40 day of race), 10k Run $35 ($45 day of race), Kids Races $15 ($20 day of race) To register click here. Check out Louisville’s Halloween race — Monster Dash! This year’s theme is ZOMBIES, so throw on your costume and get ready to run. There will be 2 distance choices, the 5k “Fun Run” is for the entire family to run together (Ages 5 and up)…strollers allowed. The 10k Race is for the bit more serious runners going for a place in their age divisions. Immediately following the 5k and 10k, there will be 3 different races for the “Little Zombies” ranging from 1/4 mile to 1 full mile. Kids receive custom kids bib, glow stick, meal, milk/drink, kids candy, finisher medal and cool finisher gift. Post-event activities include a costume contest, trick or treating for kids as well as a party where adults will receive one free beer from Avery and kids receive free juice or soda. For more info, click here.